We explored remote monitoring for winter storage crop use. You can read more about our project at the very bottom of this page. Directly below, you will find a list of remote monitoring suppliers. Fido – Open-source / DIY monitoring and alarm system – http://farmhack.net/tools/fido-temperature-alarm-sends-text-messages. New England Farm Sensors (Larry Manire – Coventry, RI) – Providing monitoring system consultation and installation services. http://nefarmsensors.org/. Larry maintains a growing list of vendors and suppliers of remote monitoring systems. Smart Farm Innovations (Robert Arnold, Argyle, NY) – Providing consulting, technical assistance and support for farm data, networking, website, and monitoring systems. Authorized Monnit reseller. SensorPush – Simple, wifi-based temperature and humidity sensor systems. Simpler Systems – If you don’t have wifi, cellular, or phone connectivity, these simple temperature switches will do the trick. Use them to control a 12 VDC circuit that lights a light, buzzes a buzzer, or dials a phone. NOTE: These are generally low current and low voltage systems. Check the specification to confirm that they will work for your application. ThermAlarm – ThermAlarm offers a series of sealed temperature driven alarm switch systems. TempAlert – Winland makes a line of TempAlert products including a single output min/max and a dual output min-max, and also have a low temperature, remote bulb EnviroAlert setup for multi-zone coolers. QA Supplies (Norfolk, VA)- Postharvest supply company; offers several logging and monitoring systems – www.qasupplies.com, 800.472.7205. Am I missing something? Please email me. This work was originally focused on monitoring winter crops in storage, but is relevant to many monitoring needs on farms. Storage crops such as beets, cabbage, carrots, garlic, onions, parsnips, potatoes, sweet potatoes and winter squash can be stored for many months after harvest under specific storage conditions. However, several distinct sets of conditions are optimal for these crops, and achieving each condition requires careful control and monitoring of temperature and humidity. Meanwhile, high tunnels and greenhouses with early- or late-season crops are vulnerable to sudden and sever changes in temperature or power interruptions impacting heating systems. 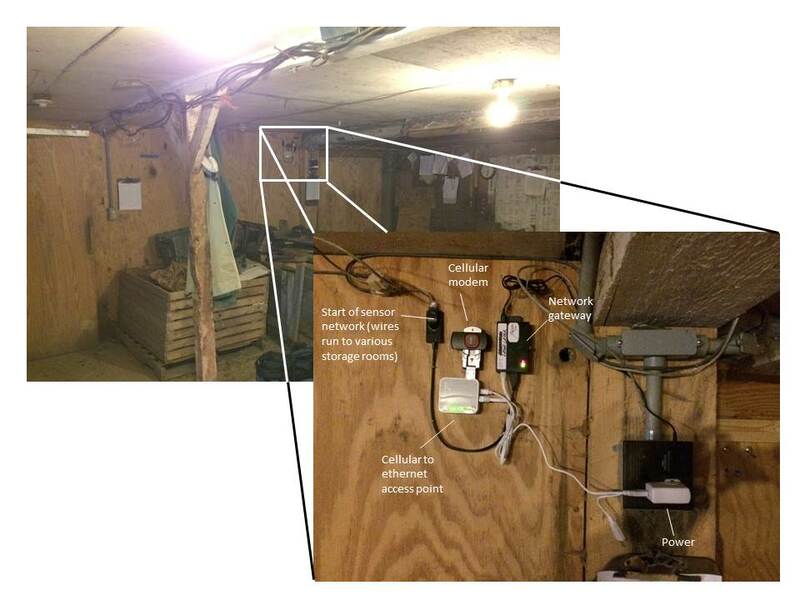 In the Fall of 2013, supported by a Service Provider Grant through the Vermont Working Lands Enterprise Fund, UVM Extension began a pilot demonstration of winter crop storage room monitoring across Vermont with temperature and humidity sensors. 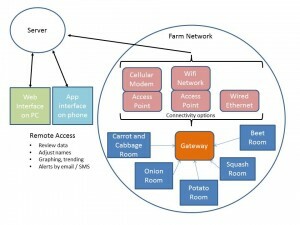 When combined with a network gateway these sensors send data to the internet and ultimately farmer’s phones and computers. This project has demonstrated monitoring and improving storage conditions and product quality of approximately 423 tons of winter storage crops at 9 farms annually through-out Vermont. The estimated value of these storage crops was $910,000 annually. In addition to reporting the temperature and humidity of the rooms, these monitoring systems provide notification of the participating farmers about abnormal conditions reflecting control problems, open doors and failing or inoperative equipment. Perhaps most notably, the systems in the field increase the confidence of growers to pursue expanded winter crop storage as a season and marketing extension mechanism in response to increased local demand for local produce. We have also been able to better understand the performance of storage systems which generally include refrigeration and heating equipment that use electricity and other fuels. In partnership with Efficiency Vermont, the team reviewed energy consumption of the systems and using focused auditing provided upgrade recommendations for each site. Remote monitoring of cold storage spaces using the internet involves the sensing of conditions, transmitting that data to a gateway or logging device, transmitting that data again to a server or cloud service, and then retrieving that data on a web enabled device. Notifications can also be part of this, i.e. “pushing” an alert to the user when predefined thresholds are exceeded. A typical system is shown in the schematic below (click for better detail). As shown in the schematic, monitoring systems typically include sensors, a data aggregator (network gateway), internet connectivity, data server (usually a subscription), and an application or website to access data. In practice, there are many different ways to build these systems. Some sensors send data to the gateway with wireless communication. Others use wired connections. Some monitoring systems are simple switches that turn an alarm on. Others can be used to control system based on the sensed conditions. Wireless communication can be challenging through metal materials such as those commonly used in cooler box construction. Some wireless sensors have remote antennae which allow the sending probe to remain in the cooler while the antenna is routed outside for improved communication reliability with the gateway. Wired systems were chosen for multiple installations in this project because we were able to find a relatively inexpensive option and because we had struggled with wireless communication previously. The majority of the monitoring systems used in this project were from Mojyle. At the time this project was conducted the installed system costs were approximately $800. $185 for a network gateway (iMonKit Lite), $356 for sensors (typically 4 sensors @ $89 each, one for each storage zone) and $60 (annual) for web portal access. Installation labor is estimated at $200 (4 hours of ethernet cable routing and connector attachment). These costs don’t include troubleshooting time which was quite high in the case of the pilot project. An example of a typical “one-wire” system connected to the internet by a cellular modem is shown below (click for better detail). This is what a monitoring system’s gateway looks like in real life. This setup used a cellular modem for internet connectivity. This was later switched to a wired/wireless/wifi-extender arrangement to avoid cellular data expenses. (Click image for better detail). Wireless devices (transmitters) don’t work well in metal boxes if the other parts (receivers) are outside the metal boxes. We found moving the gateway into the cooler box where the wireless sensors are located can improved local network reliability. But this requires separate attention to how the gateway has internet connectivity. A remote antenna for wireless sensors can also be helpful (sensor stays inside, antenna is sent through the box wall). 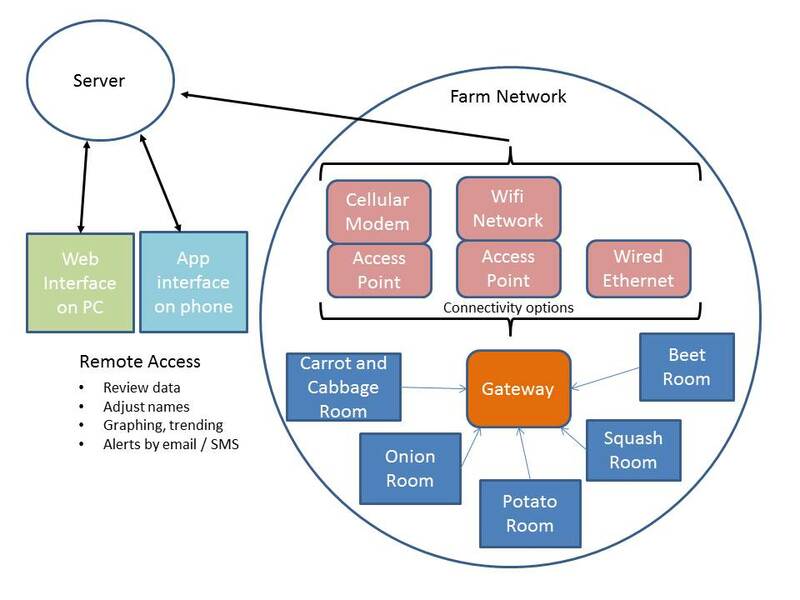 Internet connectivity is still very limited at most farms. Even if the office has internet and wifi, the cold rooms and greenhouses may not. Wifi extenders are useful for getting the signal further out into the field and outbuildings. Wifi extenders are also helpful for converting a wireless signal to a wired ethernet connection using the ethernet ports on the back of them. Cellular coverage is also very limited and otherwise challenging. In the absence of broadly distributed ethernet and wifi at some sites we implemented cellular internet connections. This adds yet another part to an already complicated system. Cellular connections are not very reliable, even when using a stationary transmitter/receiver. The data plans are also still quite expensive, but some lower cost options specifically for these sorts of systems are becoming available. Measurement of humidity in storage is a challenge for current sensor technology. There are currently no cost effective, reliable, and accurate RH sensors that are suitable to cold storage environments. I am working on a solution to this; a prototype has been built and we are in pilot production and field trials. Stay tuned.